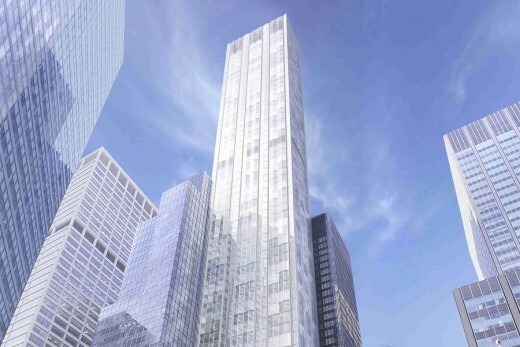 This 61-storey residential tower at 100 E 53rd Street continues the practice’s investigations into the nature of the tall building in New York, exploring the dynamic between the city and its skyline. 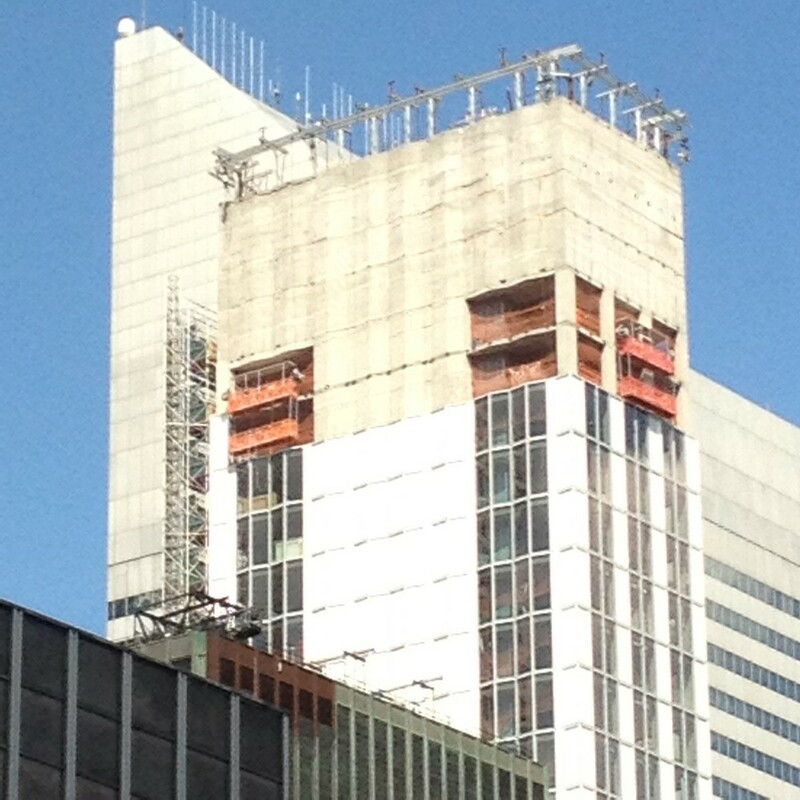 Located on the corner of Lexington and 53rd Street, it replaces the old YWCA building in Midtown Manhattan. 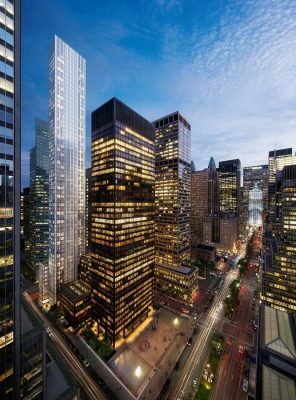 Formally, it responds to the precedent set by two neighbouring twentieth-century Modernist icons – SOM’s 21-storey Lever House of 1952 and Mies van der Rohe’s 38-storey Seagram Building of 1958. In the spirit of Mies’s philosophy of rationality, simplicity and clarity, the tower has a slender, minimalist geometric form, designed to complement these distinguished neighbours. The entrance is recessed beneath a canopy that sits harmoniously alongside the entrance and pavilion of the Seagram Building. 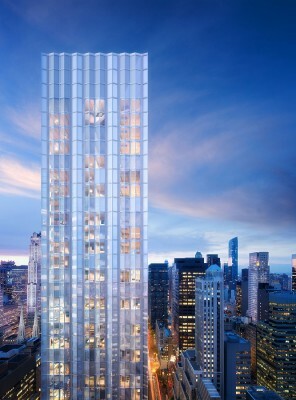 The entry sequence continues on a single plane from the street to reveal a glazed atrium that joins the tower to a smaller building on the right. The smaller building houses a bar and restaurant, a spa and swimming pool, the tower contains lounge areas and apartment levels. From the floor of the atrium, the tower rises up like a soaring vertical blade, the view up creating a sense of drama and reinforcing the connection between the summit and the ground. Some of the larger apartments occupy the entire floor area of the higher levels. The tower’s slender form creates a narrow floor plate, allowing the interior spaces to be flooded with daylight and creating spectacular views across the city from every side. An innovative glazed skin wraps around the building, concealing the structural elements which are further masked beneath integrated shadow boxes. 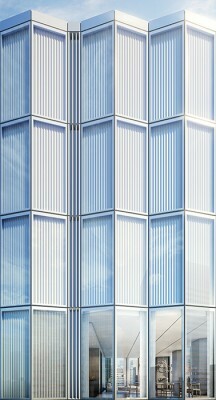 To preserve the smooth appearance of the facade, opening vents in the glazing flap discreetly inwards. 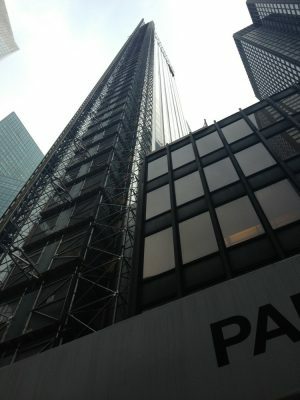 The effect is a sheer envelope that shines in brilliant contrast to the dark bronze of the Seagram building. 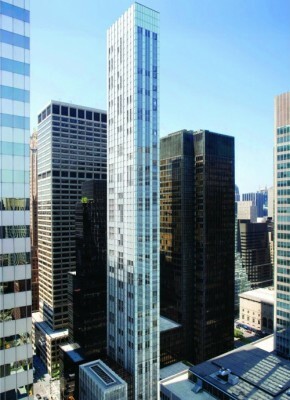 One Hundred East Fifty Third Street is the consummate Midtown Manhattan residentialskyscraper. 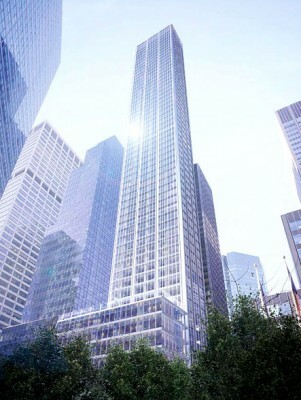 Located steps from Lever House and the Seagram Building, the condominium honors the genius of those masterworks by interpreting historic modernism for 21st-century living. 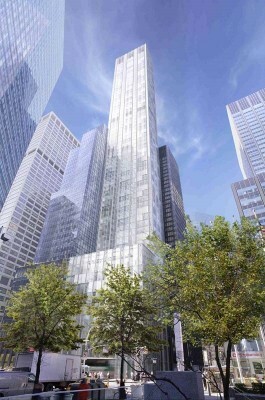 The new tower adjoins a nine-story base, which contains luxury loft apartments and amenity spaces, and soars to 711 feet. 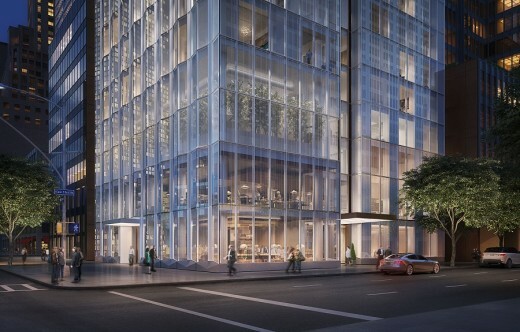 A remarkably transparent low-iron glass skin unites both volumes; faceted east and west facades inject a new geometry into the Midtown skyline and create abstract bay windows for occupants to enjoy. 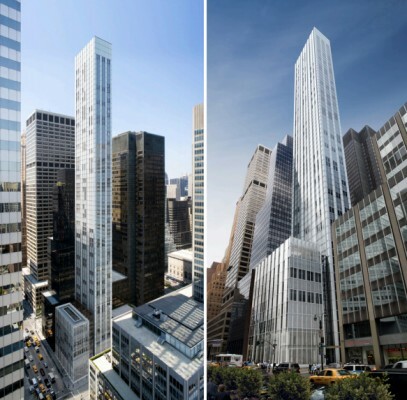 RFR Realty’s 63-story, 94-unit luxury residential tower at 100 East 53rd Street has been rising since early 2015. The tower has since topped out at 711 feet above street level, according to Curbed. 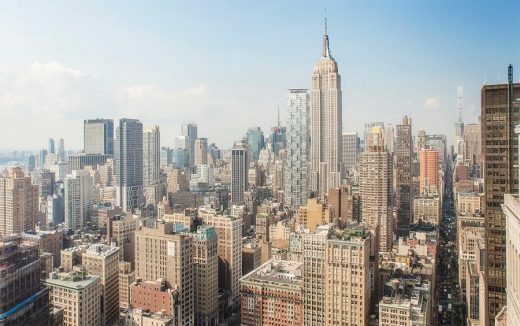 Units will come in one-, two-, three-, and four-bedroom configurations, and one of the two four-bedroom duplexes will be a 6,517 square-foot penthouse. Completion is expected in early 2017. 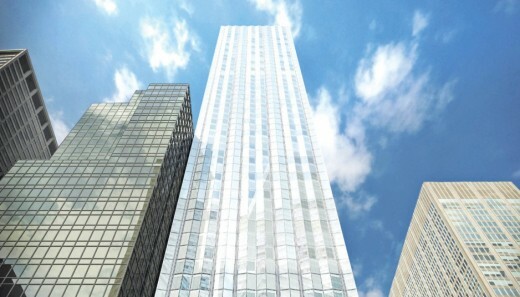 100 East 53rd Street was previously known as 610 Lexington (Avenue).